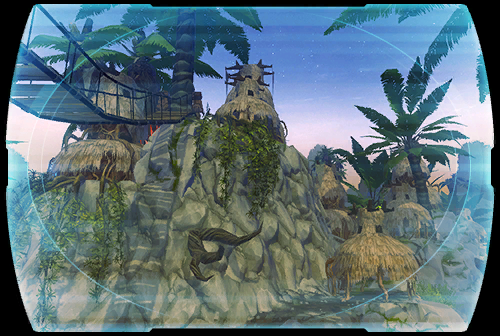 Raider's Cove has become a top stop for those who like their fun times in a tropical paradise seasoned with a healthy pinch of danger, and the Blaster's Path cantina is the go-to destination. Set a short distance from ebony-sanded beaches, patrons can enjoy their drinks out under the warmth of the sun and in Rishi's tranquil waters. And when the weather turns, the Path serves as shelter from relentless monsoons and chilly winter nights. The Path's two stories offer ample space for drinks, concerts, card tournaments, and large private events, leaving many first-timers stunned to hear the cantina's owner downplay its qualities. But anyone who knows Kareena knows that her dry cynicism comes from regret. Ever since she allowed the Nova Blades a stake in the Path, the Blades have had their run of the place and profits have declined as a result. Kareena does hold onto a glimmer of hope that she'll one day make the Blaster's Path fully hers again, though she's not exactly holding her breath. In the hearts and minds of many of its residents, Raider's Cove isn't some cobbled-together beach town--it's their safe haven. The same relative lawlessness that allows unsavory types to steal and fight with abandon also gives those who don't wish to live under the rule of galactic authorities a suitable home. And it's not as though Raider's Cove is a hotbed of anarchy: the town's founding pirate crew, the Nova Blades, routinely contend with residents and visitors who become too much of a nuisance. The first phase of Raider's Cove, now a bustling port, was built using only what the stranded Nova Blades had available from their crashed ship, plus whatever natural resources they could plunder from the local Rishii. As more pirates arrived on Rishi and the local economy began to flourish, relatively polished structures were constructed along the black-sand shores and Raider's Cove became a vacation destination for adventure and trouble seekers everywhere--a true resort for the wicked. Species-wide, the Rishii appreciate community. Many, however, also exhibit an affinity for transience. Because of this, Rishii villages are designed to offer lodging and social activities in a tribal setting for as long as any family or individual Rishii wishes to remain. No one owns property but rather claims it for a time of their choosing. Rishii villages are commonly set upon high elevation near the sea, allowing the Rishii to easily spot prey in the waters below while severely restricting the pathways of would-be predators. Their huts are typically built from bark, roots, branches and cereal stalks. They are far more durable than appears at first glance, as each hut is constructed with its specific location in mind to best withstand local atmospheric patterns and phenomena. A more recent addition to their villages are wooden bridges, which have been added for the convenience of non-Rishii guests. To visitors and most of the residents of Raider's Cove, it is a shipwreck. At most, a unique landmark that stands tall along the western horizon. But to the Nova Blades on Rishi, the Aggressor is their home. Since its construction, the corvette has traversed the galaxy and beyond as part of the Nova Blades' pursuit of riches and notoriety, but now its engines and hull stand in such a state of disassembly and devastation that it will never sail among the stars again. Even as an apparent husk, the Aggressor continues to serve its owners' needs. The portion of the vessel that rests parallel to the ground is now used for security services, management and, when inclement weather strikes, social gatherings; the vertical aft has been cleverly refitted to serve as living quarters and minor manufactories, with scrap metal and wood used to fashion ladders and lifts along the ship's former halls. For a very long time, Rishi remained ignored and untouched on the fringes of the Outer Rim. Its dominant species--the intelligent, avian Rishii--lived a simple and mostly serene existence on the island-flecked world. But when a pirate craft crash-landed on Rishi more than a hundred years ago, all that changed. With its plentiful fossil fuel reserves and close proximity to a largely unexplored dwarf galaxy, this tropical pearl of a planet has since become a favorite hub for underworld types in search of riches, refuge from authorities or just a good time.